I look at certain items in my life and wonder. For example, why do home builders put in light color carpet in homes. Any mom who has a child will attest light color carpet is not family friendly. Between muddy shoes and the occasional spilled drink, it seems at least once a week that I have to clean carpets. Unfortunately, the time and effort to get the carpet cleaner out is not high on my list. I like products that can simply and easily fix the problem at hand. I want to clean the small mess immediately. When I look for a stain remover, I want one that works in many scenarios. From the carpets to furniture spills, I want one cleaner that can do it all. Also, I want the cleaner to not be full of chemicals, especially harsh chemicals. Right now I'm trying Perky Spotter Plus. This product was created by Groom Industries, a leader in the professional cleaning supplies for over 35 years. 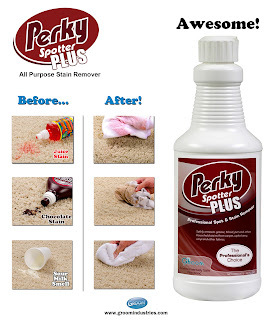 Perky is designed to fight the source of the stain in the carpet and pad. In addition to cleaning the stain, the formula neutralizes odors. Overall, your carpet and fabric has an improved look and smell. What I liked about this cleaner is that it was good for spot cleaning. I often get small areas of dirt or mud on the carpet in the family room (darn football cleats). This cleaner was fast and easy to use on those small stains. I simply squirted the solution and dabbed with a clean white towel. In under 5 minutes, my carpet was clean and I didn't have to fight with a big machine to get it that way. 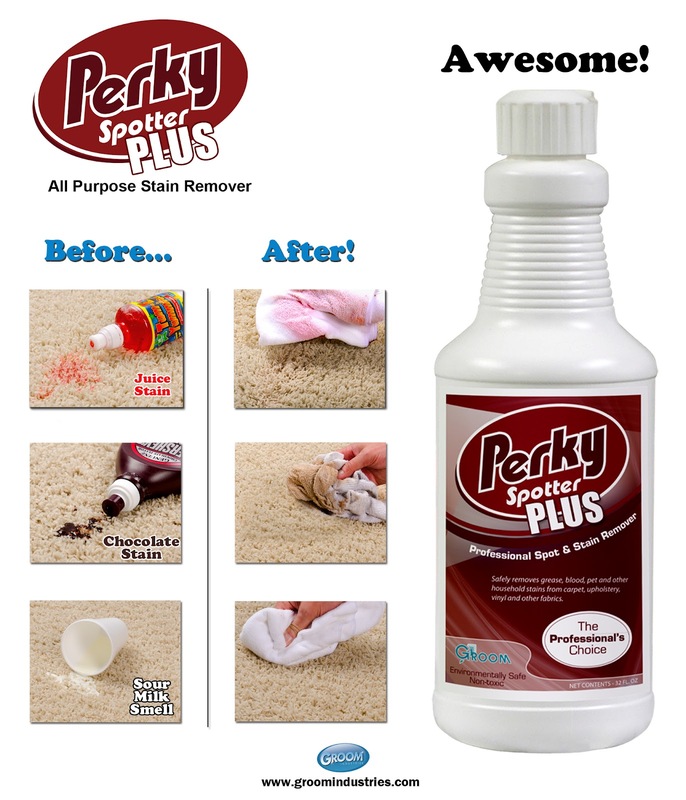 So if your family is looking for a spot cleaner that gets to the bottom of the the stain, try Perky Spotter Plus.